I wonder if you know what it means to be aware of something? Most of us are not aware because we have become so accustomed to condemning, judging, evaluating, identifying, choosing. Choice obviously prevents awareness because choice is always made as a result of conflict. To be aware ... just to see it, to be aware of it all without any sense of judgment. Just be aware, that is all what you have to do, without condemning, without forcing, without trying to change what you are aware of. If you are aware choicelessly, the whole field of consciousness begins to unfold. So you begin with the outer and move inwardly. Then you will find, when you move inwardly that the inward and the outward are not two different things, that the outward awareness is not different from the inward awareness, and that they are both the same. Everything about us, within as well as without -- our relationships, our thoughts, our feelings -- is impermanent, in a constant state of flux. But is there anything which is permanent? Is there? Our constant desire is to make sensation permanent, is it not? Sensation can be found again and again, for it is ever being lost. Being bored with a particular sensation, I seek new sensation. Every sensation comes to an end, and so we proceed from one sensation to another and every sensation strengthens the habit of seeking further sensation. My mind is always experiencing in terms of sensation. There is perception, contact, sensation and desire and the mind becomes the mechanical instrument of all this process. With the arising of sensation comes the urge to possess; and so begins the turmoil of desire. And the habit of seeking further sensation. And is there an end to sorrow? Is it possible to live a daily life with death, which is the ending of the self? 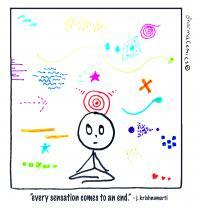 There is only one fact -- impermanence: every sensation comes to an end. Can the mind, the brain remain absolutely with that feeling of suffering and nothing else? There is no movement away from that moment, that thing called suffering. Is there an action in which there is no motive; no cause -- the self does not enter into it at all? Thought identifies itself with that sensation and through identification the 'I' is built up. Identification with sensation makes the self. If there is no identification; is there a self? So is it possible not to identify with sensation? So we are asking, is there a holistic awareness of all the senses? Just be aware ... effortless observation ... choiceless observation ... and to learn, to find out whether it is possible to allow sensation to flower and not let thought interfere with it -- to keep them apart. Will you do it? Born in a small town in South India, Jiddu Krishnamurti was adopted in his youth by Dr Annie Besant of the Theosophical Society. Proclaimed to be a world teacher whose coming the Theosophists had predicted, a world-wide organization was formed and the young Krishnamurti was made its head. In 1929, however, Krishnamurti renounced the role, dissolved the Order with its huge following, and returned all the donated money and property. From then, for nearly sixty years until his death, he traveled throughout the world talking to large audiences and to individuals about the need for a radical change in mankind. Reading above is excerpted from 'On Sensations'. Seed questions for reflection: What do you understand from "outward awareness is not different from the inward awareness?" Can you share a story of a time that you were aware "choicelessly"? How can we develop the ability to be "aware of it all without any sense of judgment"? I had a similar observation years ago while at a meditation retreat. I noticed that the order of causation was different than I thought when it came to emotions. I had believed that thoughts were causing emotions, and sometimes they do, but I also noticed that sometimes emotions were just arising randomly. Then within a split second my mind was assigning some reason for that emotion, a thought, and then the thought began to amplify the emotion. But if I stopped it at the moment of awareness of the emotion, and recognized the emotion as having no cause, it simply dissipated, passing on into the next emotion. Ever since then I've been very aware of when emotion is causing thought vs thought causing emotion, and have had a much easier time choosing my emotions at will. Powerful new ideas I need to marinate in my head, heart and all through my body starting now! A rush of crisp autumn air burning my cheeks and causing my eyes to water. When I was diagnosed with an Incurable illness after a pretty healthy life I was first shocked, in denial, then realized that I had been woken up, given a lesson about the impermanence of everything. I felt blessed with this awakening. Let us understand this very clearly and instantly that "Outward awareness is not different from the inward awareness as the observer is the observed." Being fully and choicelessly aware is a state in which there is no residual memory left, and to reply to your question is abserd. To be awareful, one must be free from all kind of binding.All kind of thought and frictions. One must be very passionate and full of energy . Working in a public elementary school, I am surrounded by little ones. As they (the children) are choiceless, I try to be the same, in judgment. (They did not choose to be born into the families they were given . . . They are not in "basic" control of their circumstances.) DNA, environment and "chance" dictate a lot for each and EVERY child who walks through our front door. Will each child be "seen", valued, respected and loved the way God desires them to be? Judgment separates. Understanding unites. As Pope Francis was recently quoted, "who am I to judge?" Love (God) holds us together! To me, Krishnamurti is speaking about "objective" vs "subjective" experience when he describes the "outward awareness" vs the "inward awareness". As human beings, we always have the tendency to personalize things and being able to see objective reality without personalizing it is more of an ideal, something to aspire to. This only happens when we can let go of the "story" of judgment and criticism and take the smaller "self" out of the picture. Since the only thing that seems permanent is impermanence, I have to wonder if either is real, if reality, or, if you will, the "true self," is beyond dualism and therefore "neither this nor that." During my dark crucible nights of substance abuse, I was left with no choice but to Accept and fully embrace that fragmented part of me that I have denied, judged and repressed for decades. UNTIL I was able to do that with Awareness (it took several deaths followed by resurrections toward Rebirth).... that which I resisted ... persisted. The gifts are numerous and ineffable ie authentic self love that lead me to compassion. First, toward myself that I can now extend to others. This Awareness without judgement IS true freedom. A lot to, once again, think about. I find it difficult to be a human being, acceptance of that is a hard task. Choiceless Awareness would be perfect. It comes and goes. There is no Answer. True every Sensation comes to an end but every sensation trails sanskar for our soul. Suppose someone near to us says hi I am going to London for fun immediately our sensation activates and jealousy sanskar trail to our soul alas I AM NOT GOING bad luck of me, this sensation will have its own life but creation of sanskar unstoppable. And to get out of such sensation very difficult for human being and that's why we meditate to purify our soul. Thank you for this article. My understanding is that Krishnamurti is speaking nondualistically in saying that "outward awareness is not different from the inward awareness." He is aware that there is no outward or inward except in our thinking. Other than in our thinking, there is only being and awareness, there is only unity. I have precious few moments of choiceless awareness which are without expectation, without agenda or goal, without judgment, without trying, without pushing or preventing, without choice, and are simply being aware. They are moments of "Be still and know that you are God." We can develop the ability to be aware without sense of judgment by becoming aware that there is such awareness, which we usually are awakened to by someone who knows something about it, and by some time spent learning from such a person, and then by practice. After infancy, I think it takes time and effort to learn to be timeless, effortless, and aware choicelessly. Perhaps it is best stated by "What Is, Is." or "It is what it is." And it will always change, whatever the Is, Is. :) Therefore we have no need to grasp so tightly or to fear because the Is will soon change. I have been fortunate to experience times of choicelessly being Aware and not judging whatever was happening or unfolding, what a lovely state. I've had this with people and situations when I reminded myself "It is what it is." That was so liberating. To then simply BE in it ane experience it. Holding the same awareness Inwardly to me signifies that my emotions, my feelings, my thoughts also are impermanent so do not judge oneself harshly or even name thoughts, feelings as Good or Bad, they simply ARE. Again, this is freeing and can help us not become stuck in our thoughts or judge ourselves inwardly. YAY! I loved this passage, thank you for sharing it! HUGS from my heart to yours.